Licensed Physical Thysical Therapist and owner Caryn Connarton offers physical therapy evaluations and prescriptive pilates programs here at Beyond Fitness. In as little as one session, though usually no more than three, you will receive a thorough postural evaluation, injury assessment, written home exercise program, as well as exercise modifications that will allow you to return to your preferred exercise routine, or attend our regular pilates or barre classes safely. 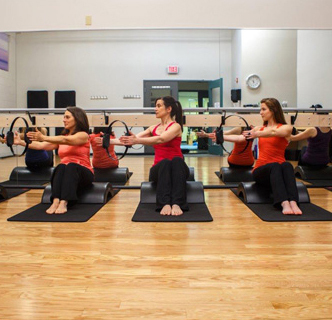 These initial sessions ensure you will get the most therepeutic pilates experience possible. If you have hurt yourself exercising in the past, this session will tell you why and how to avoid injuries in the future. Initial sessions with Caryn are $155. The first session is 60-70 minutes. Follow-up sessions are $128 (weekdays) or $155 (weekends) for 55 minutes. While Caryn does not accept insurance of any kind, receipts from these sessions can be submitted to medical flexible spending accounts or insurance programs with "out-of-network" provider privilages. 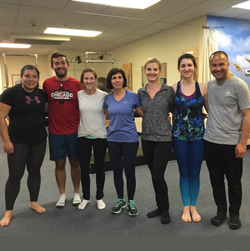 Read about our wonderful instructors and their diverse backgrounds. What students of all ages and experience levels say about our studio! Descriptions of all our classes, how to register and studio policies. Workout props and equipment are for sale in the studio. Pilates apparatus sessions, tailored to your specific needs. Pre-Post Natal, For Kids/Teens, Post-Injury Workouts and more.